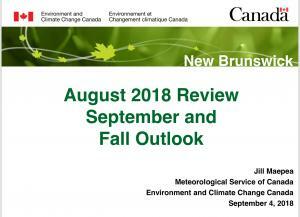 From Jill Maepea of Environment and Climate Change Canada, here is the August review with an outlook for fall. August mimicked July very closely with hot and humid conditions prevailing across the province. The main exception was a bit more precipitation mainly in the form of thunderstorms and showers (some of which were severe). See all the details in the attached final report for August and the outlook for fall. UPDATED: See a combined summary for June-July-August and an outlook for fall.